Happy New Year to all! Hope everyone is recovering easily today. Eating lentils is a must with Italians to bring luck and prosperity for the upcoming year. This salad is simple to make and can be served with just about anything. Plus, it can be made well in advance. We’ll be having our Vasilopita today as well – can’t wait to see who gets the lucky coin! Cook lentils for 15-20 minutes, or until tender. Meanwhile, saute bacon in a pan. Remove to drain, and reserve drippings in pan. Turn heat to low and carefully add vinegar, oil, thyme and salt to pan, whisking until combined. Turn heat off. Drain lentils and transfer to a bowl. Pour hot dressing over lentils, and bring to room temperature. Add tomatoes and bacon to lentils. Toss and serve immediately, or refrigerate until ready to eat. 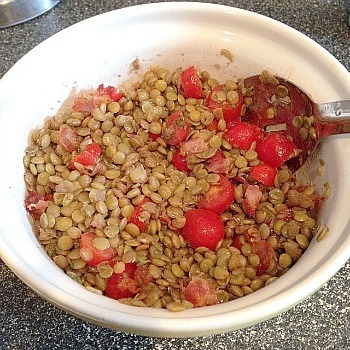 This entry was posted in bacon, lentils, make ahead, QuickAndEasy, salad, tomatoes. Bookmark the permalink.